Amazing - I've been blogging since October 2006 and I have yet to write about sticky notes! Well, it's time to remedy that. Office supply fans, this one's for you! And if you want something a bit more interesting, there's plenty to choose from. Russell+Hazel is one place worth looking. 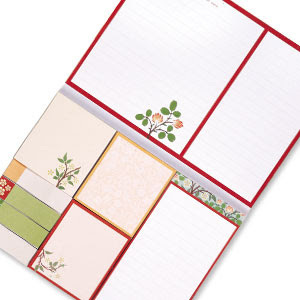 [photo from See Jane Work, which sells one of Russell+Hazel's many sticky note pads] Update on March 31, 2010: See Jane Work still carries sticky notes, but not the ones from Russell+Hazel. 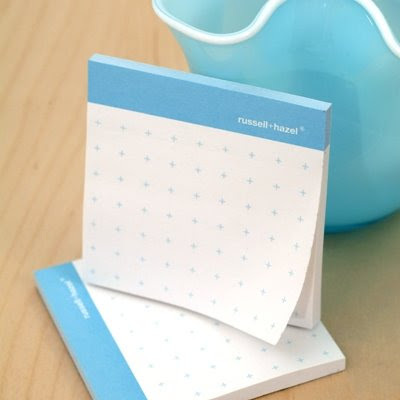 These simple lined adhesive notes (available in four colors) come from M.O. Update on Jan. 13, 2011: It seems these are no longer available. Moving on to more elaborate sticky notes, Galison/Mudpuppy has a number of choices. Each set has eight pads; the pads are in three different sizes. 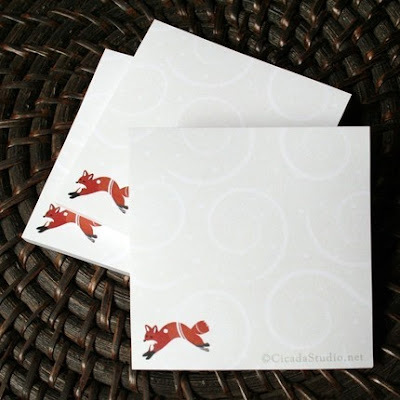 And moving along to Etsy, Cicada Studio has these sticky notes with foxes - as well as others with birds. 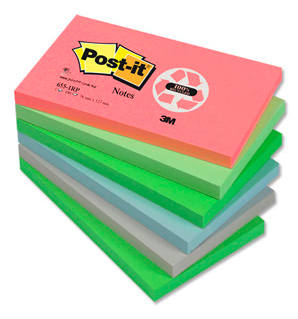 Update on July 24, 2013: Cicada Studio is no longer selling sticky notes. If you want cute, Asking for Trouble is glad to oblige. 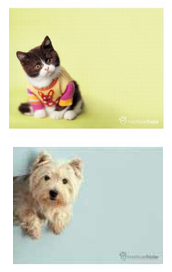 Rachael Hale is known for her animal photography, and some of that has been translated to sticky notes - available here. 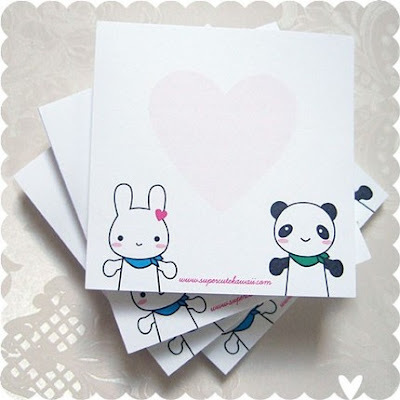 And then there's Jellycat, known for its stuffed animals - which now provides animal-themed sticky notes, too. 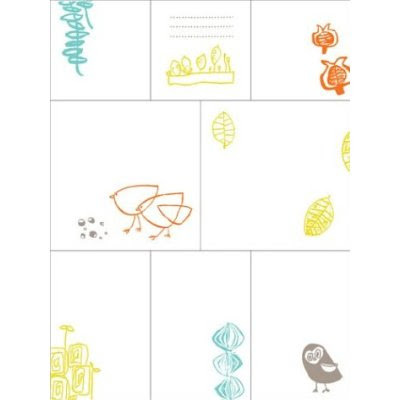 And finally, from Australia, kikki.K brings us these fanciful sticky notes. 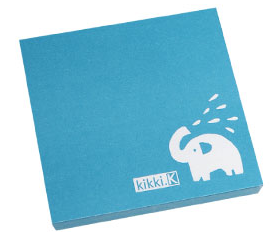 Update on March 31, 2010: Kikki.K still sells sticky notes, but not the one shown above. 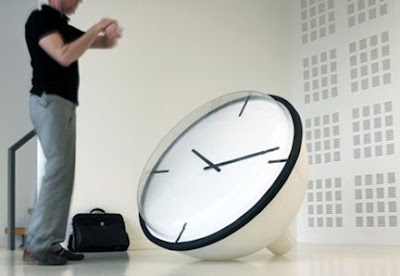 Looking for a nice clock to help with your time management? I've got suggestions! 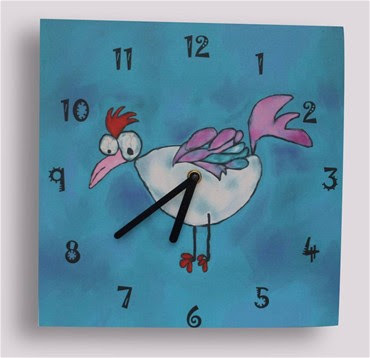 First, because I'm a sucker for cute (but not overly cutesy), take a look at the seven wall clocks from The Purple Cow. Unfortunately, they aren't distributed in the U.S. yet. Update on Aug. 11, 2012: The Purple Cow now longer makes clocks. Jacques Dorier makes paper sculptures, and I see his work includes some fanciful clocks. 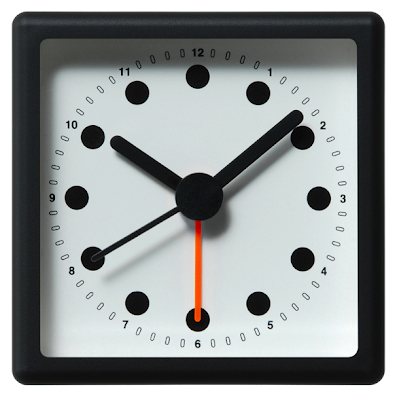 If you have the room for it, you might consider this general store scale clock. 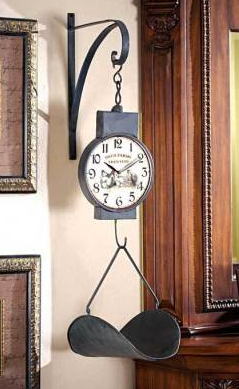 Update on Aug. 11, 2012: This clock was sold by Victorian Trading Co., but that site no longer sells it. This vintage map wall clock appeals to the traveler in me. 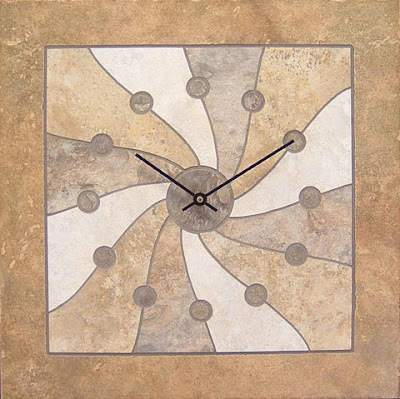 And finally, for a very different and stunning look, there are the tile clocks made by Michael Riley. The web site is out of date - the last shows listed are from 2007 - so I hope he's still making these. I'll update this post if I learn anything new. 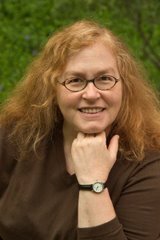 Update on Jan. 29, 2009: Sadly, Michael Riley wrote to me, saying, "I am not making clocks at the present time, and all of the ones on the web site have been sold. Thank you for your interest." Real Simple Treasure Trove! 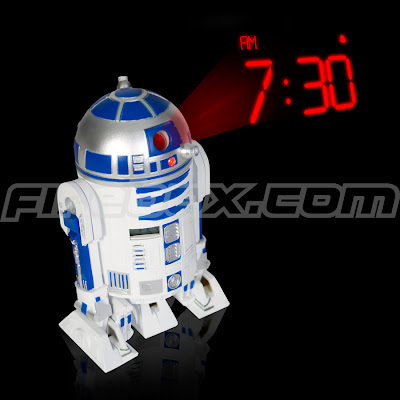 Funny Alarm Clocks! 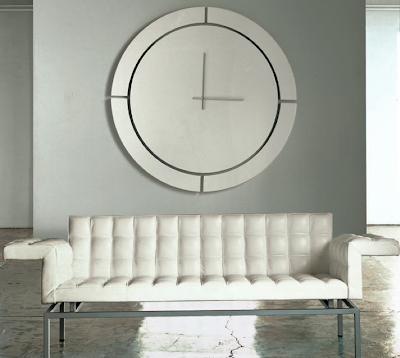 A good clock can be hugely helpful - and these clocks are huge. (Of course, so are the price tags.) But sometimes it's fun to just gawk; in my next post, I'll point to some more practical options. 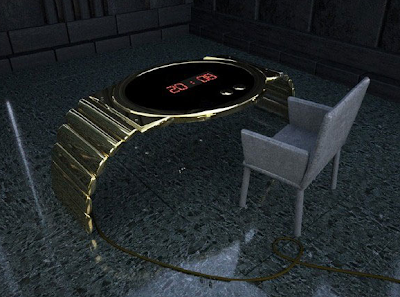 And finally, there's the 24ct gold watch table for 25,000 pounds. (At today's exchange rate, that's $35,413.) [via Unplggd] Update on March 10, 2011: I'm no longer seeing this product for sale. The steady growth of the organizational gear industry only reflects the hunger for gaining control of the huge volume of miscellany that people are collecting in their lives. All the plastic, wire, and wood boxes; all the trays, notebooks, folders, and desk accessories at least provide defining boundaries that help contain and separate stuff. But without a good underlying model for how and why to contain and separate what stuff, and for what purpose, shoppers still wander glassy-eyed down the aisles of the office supply and organizing stores, rather clueless as to what they really need. 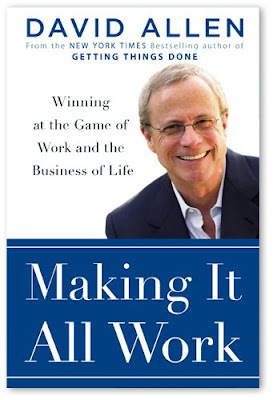 Labels: books, GTD, What does it mean to get organized? How about that kangaroo? 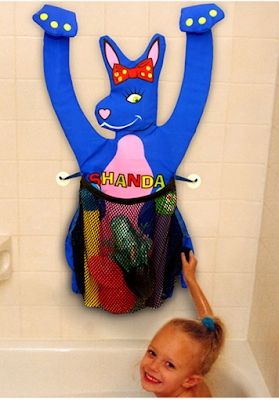 John, the CEO/Inventor at Shanda Toys, wrote to me today to introduce his new bath toy organizer - and I'm very glad he did. It attaches with suction cups - or the velcro paws can curl around the shower rod. 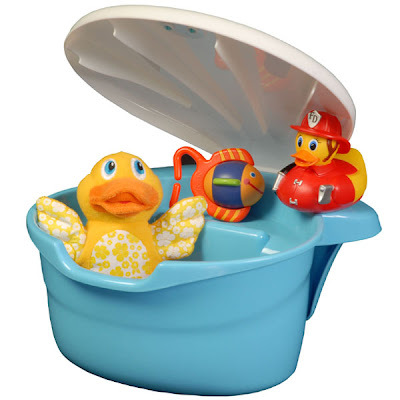 This tub toy organizer that hooks over the side of the tub is not as eye-catching, but it might be just the right things for some households. There's a pink version, too. 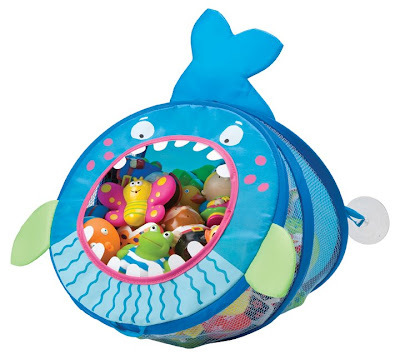 And Alex Toys makes the Hold It All Whale (and the Hold It All Fish) - pop-up storage bags with suction cups to attach them to the wall. Aunt Alberta didn't like it at all (that is why it was put away in a little back bedroom upstairs), but she couldn't get rid of it because it had been a wedding present from someone she did not want to offend. That was written in 1952, and it's the same issue people confront today. No matter how we try to avoid getting gifts of things we don't like, some of them sneak into our lives, anyway. First of all, it is perfectly OK to not save every gift you've been given. As Don Aslett writes, a gift is a "message of love and appreciation" and "its message will live with us, be part of us - forever, possibly" without holding onto the gift itself. If there are no issues about hurting someone's feelings, it's easier to let a gift go. You can exchange it, donate it, re-gift it, or sell it with no qualms. But what about gifts from people who will both notice and care if their gifts aren't displayed in your home, or if you don't wear the jewelry they bought you? And what if the gift is handmade? As Juli Culbertson and Marj Decker write in Scaling Down, "Fewer items create greater guilt than lovingly crafted gifts you can't stand." There are no simple answers here. As much as I don't like my home to be filled with things I don't like, I'd be hard pressed to give away something if that would seriously hurt the feelings of a beloved friend or relative. One common approach is to keep and display such items for a while, and then move them along. If you have ideas on how best to handle such gifts, please share them in the comments. What organizing products are you looking for? 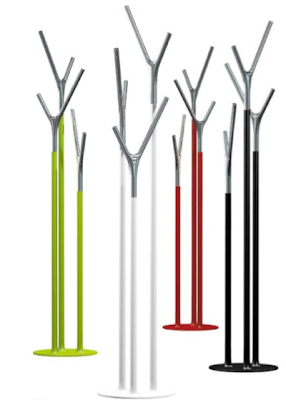 The nice woman I spoke with today was looking for coat trees - and the first one on my previous coat rack post might suit her just fine. But I thought I'd poke around and see what else I could find. 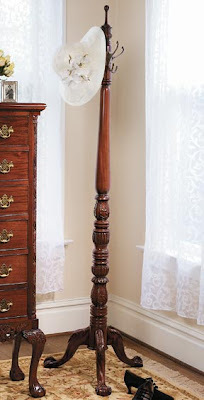 The one above is a very traditional look - a handcrafted mahogany coat tree. Update on May 26, 2011: Sadly, the website where I found this coat rack no longer seems to be working. And here's another traditional-looking coat stand, in rust-patinated wrought iron. 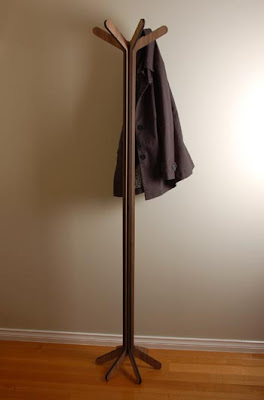 Update on May 26, 2011: The site that sold this coat stand no longer carries it. OK, so much for traditional. 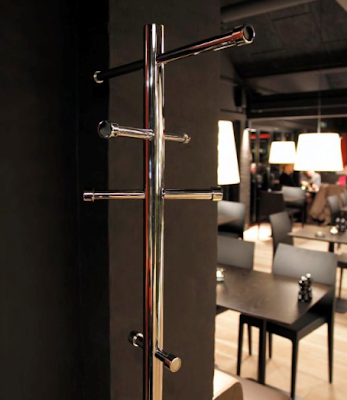 Here's the stainless steel Nova coat stand, from Frost Design in Denmark, sold by Hightower in New York. 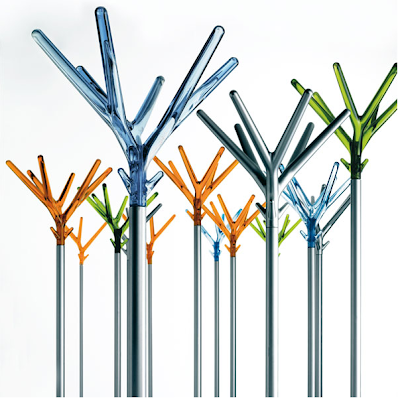 And these coat stands from Nava Design in Italy, sold by Panik in the U.K., have a somewhat similar look. Here's another modern look; this one is called the Clusterstand. Update on May 26, 2011: I'm no longer finding this product. 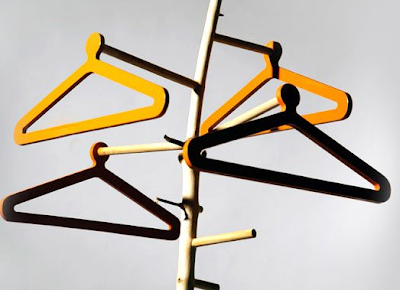 And for something really unusual, here's the Bodhi coat stand, "made from the branches of fallen trees." You can see some more pictures over on Flickr, here and here. 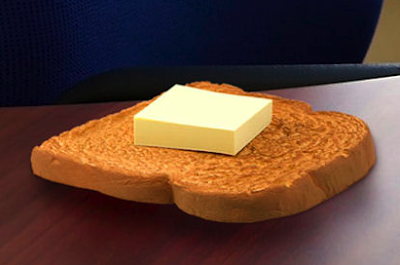 Update on May 26, 2011: I'm no longer finding this product on the designer's web site. 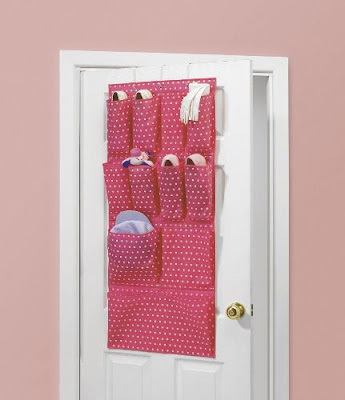 The best-known closet door organizers are those with shoe pockets - which can, of course, be used for Barbies or gloves or any number of other things. 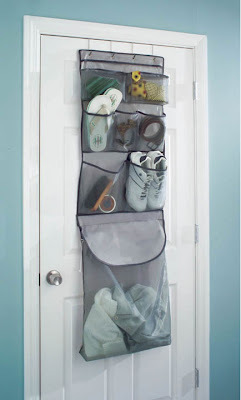 But you can also use something other than shoe organizers. While these products are (mostly) fairly prosaic, they can also be very useful. For example, here's a short, 6-pocket over door organiser (it comes from the U.K.) made by H & L Russel. The pockets are labeled Bits, Bobs, Itsy Bitsy Stuff and such. 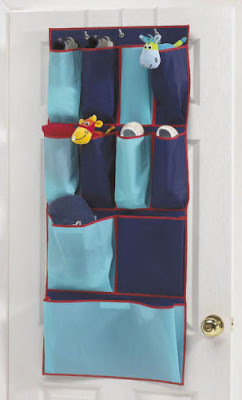 The same company makes this 11-pocket over-door organiser; there's also a blue one with a football (as in soccer, for those in the U.S.) pattern. 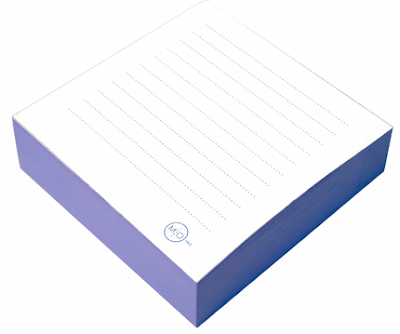 We also have a blue over-door organiser for boys and a pink-and-lilac over-door organiser for girls. Feel free to ignore the color stereotyping if your girl likes blue or your boy likes pink and purple. Update on June 17, 2012: I'm no longer finding these organisers. 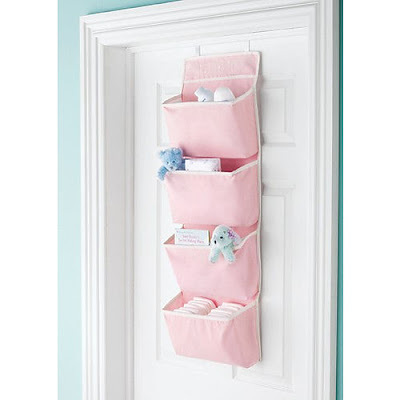 Heading to Canada, you can find this 4-pocket over-door organizer from Babies R Us. OK, it's in baby girl pink, but there's no reason not to use it for more than baby stuff! (The U.S. site has a similar product in pink and blue.) 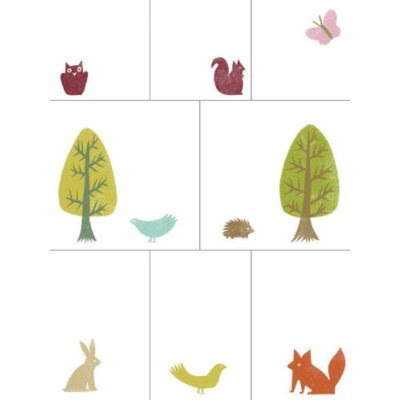 Update on June 17, 2012: I'm not finding this product on the Canadian site, and I'm not finding the blue version on the U.S. site — but I am finding this organizer in sage and natural. 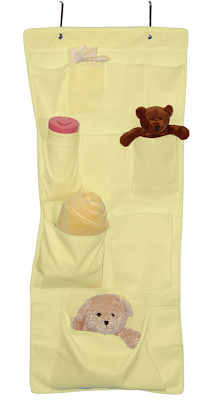 And heading over to the U.S., this ten-pocket over-door organizer, also aimed at the baby market, comes in pink, blue, white and yellow. 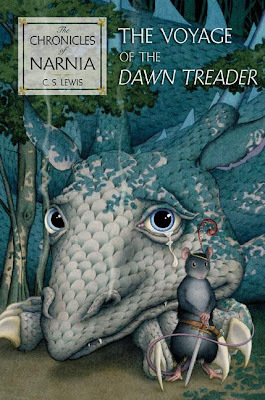 Update on June 17, 2012: This product, from Tadpoles, seems to have been discontinued. 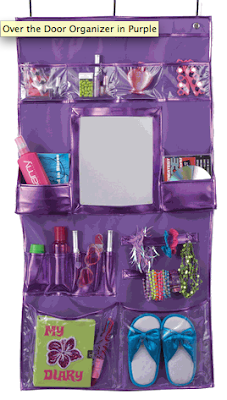 This over-door organizer by Three Cheers for Girls comes in - you guessed it - pink and purple. Update on June 17, 2012: This product also seems to have disappeared. Here's an over-door organizer with 15 jumbo pockets. Update on June 17, 2012: This one is showing as "unavailable." Another one with large pockets is this over-door 24-pocket pantry organizer. Update on June 17, 2012: This one, from Jokari, has also disappeared. 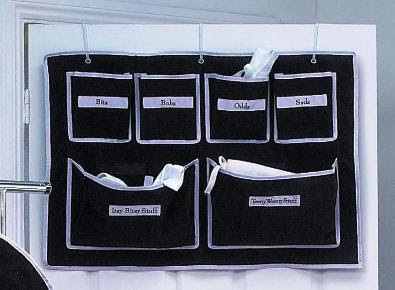 This over-door organizer has a small removable laundry bag. Update on June 17, 2012: This is yet another product which seems to have disappeared. Here's The Mutt Pack - an over-door organizer designed for dog stuff - although there's nothing really dog-specific about it, except the name. 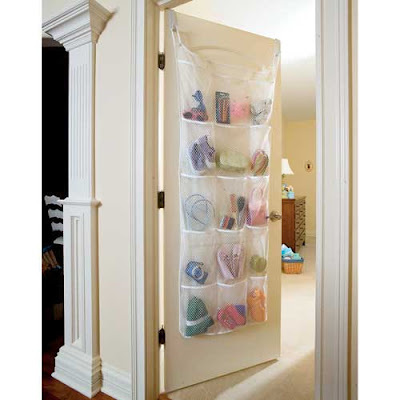 And for significantly more money than any of these other options, you can get this over-door organizer called the Packtoozi. It's made with 100% organic cotton and polyester mesh. It was designed as part of a larger organizational system to store kid-related things (bibs, snacks, toys, diapers, etc.) - "everything you need when you're on the go with your kid." The pockets are labeled accordingly - so if you want to use this organizer for other types of things, you'd want to somehow change the labels. As a professional organizer, I've been eying this poster for a while now. 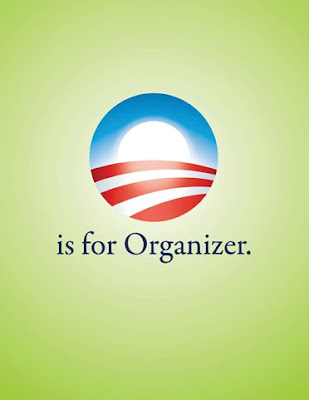 OK, I know they mean community organizer - but still. I've been reluctant to post it here because I don't want this to be a political blog - but today just seemed like the right time to share it. 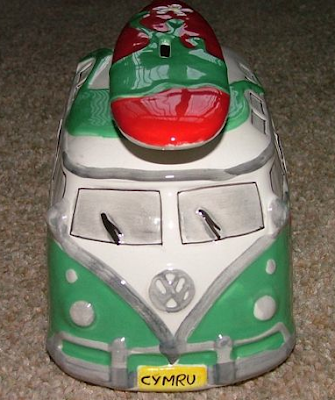 Want a colorful container for your change? 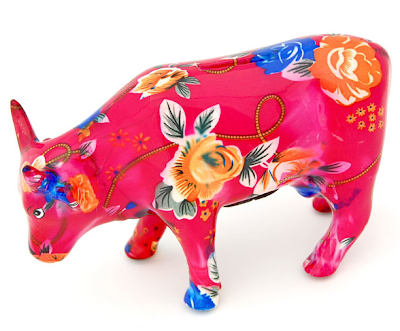 LAMA - based in Oakland, California but selling objects from Latin America - can provide you with a cow bank. [via Real Simple] Update on July 9, 2012: I'm no longer finding a web site for LAMA, nor any place to buy these banks. 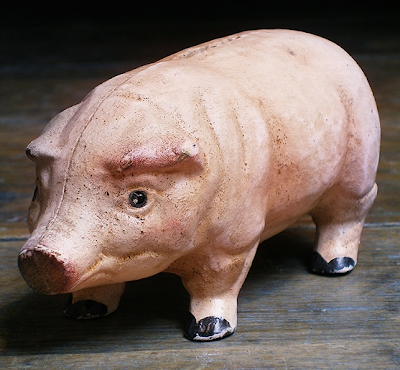 Or maybe you'd prefer a more serious-looking cast iron pig from P.O.S.H. Chicago. Update on March 2, 2011: Sadly, this pig is no longer available. 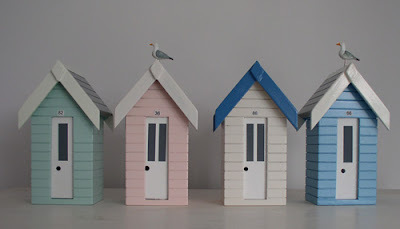 Moving away from the animals and across the ocean to the U.K., we come to these beach hut money boxes. 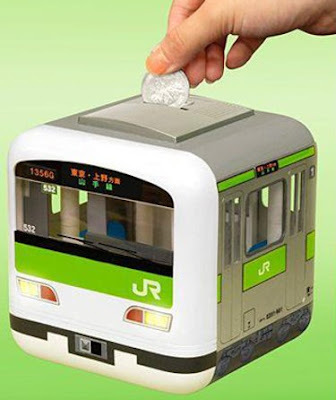 The Yamanote piggybank plays the melody from a randomly selected Yamanote line train station every time you make a deposit. (Each station has its own pleasing melody, allowing your subconscious mind to track where you are while you sleep, and waking you up just in time for your station!) The headlights come on at the same time. Note: this product ships direct from Japan and is intended for the Japanese market. Instruction manuals are in Japanese. However, operation is simple and straightforward and we are available to answer any questions.